This is a great recipe that you can fix to your taste! Add a jalapeno chili for more heat. The longer it simmers the better. Top with crushed tortilla chips or Fritos corn chips and shredded cheese. 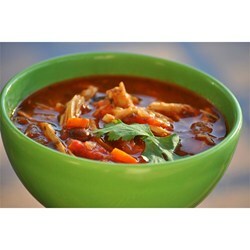 In a large pot over medium heat, combine chicken broth, chicken, salt, pepper, garlic powder, parsley, and onion powder. Bring to a boil, then reduce heat and simmer 1 hour, or until chicken juices run clear. Remove chicken, reserve broth. Shred chicken. In a large pot over medium heat, cook onion and garlic in olive oil until slightly browned. Stir in salsa, diced tomatoes, whole tomatoes, tomato sauce, chili powder, corn, chili beans, sour cream, shredded chicken and 5 cups broth. Simmer 30 minutes. RESULTS: Juicing vs Blending Giveaway!